We’re excited to announce the new options and accents we’re debuting in 2019. One will even be making a special appearance at this year’s FENCETECH in Indianapolis! Will we see you there? First, the Bufftech® Chesterfield with CertaGrain® texture fence will now have the option of a spindle accent, which will offer a modern aesthetic accent option to the Chesterfield CertaGrain 5+1 collection. The offering will include top and accent rails routed to accept 3/4″ round aluminum spindles in a matte black, powder-coated finish. The spindle accent will be available for Chesterfield CertaGrain Texture in 6′ x 8′ sections (4’10” plus 1’2″ accent) and six colors including four blends. 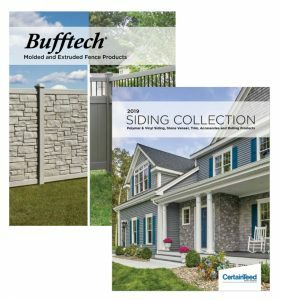 View the CertainTeed Siding and Fence catalogs to see all available fence and rail options. On the railing front, market feedback has led to the development of a new baluster/infill option for the Kingston and Oxford Vinyl Railing Systems. The 3/4″ round aluminum balusters in a matte black, powder-coated finish will be available for all six EverNew Vinyl rail colors in 3′ and 3.5′ tall, and flat or stair applications in either 6′ or 8′ lengths. The EverNew Oxford vinyl railing will also have a design change on one baluster option. The Colonial style baluster will be replaced by the Classic style baluster. This change features only subtle design differences. Attending FENCETECH this year in Indy? We’ll have the new spindle accent on display in booth 1665 on March 15-16, along with all of the newest molded and vinyl fence products included in the Bufftech product line expansion. We hope you’ll stop by and see us! Register here. Have a question about these or any of our new products? Give us a call. We’re here to help. Plus, new fence tool helps homeowners shape their yard.